This article shares with the reader the steps on how to implement HTTP Public Key Pinning (HPKP) security policy/control. This article also includes the steps to create self signed certificate, implement the security control and some tips to validate the control. Here are some good summary about HPKP from Mozilla and OWASP. Please note that HPKP is not compatible with all browsers yet but there is no wrong to experiment it. You do not need to have an authentic certificate signed by reputable CA in order to get an idea on how HPKP work. Hopefully this article will empower someone to implement this security policy in their environment or prepare them for future opportunity. 6. Next, we will generate the PKCS#12/PFX using the certificate and key using the command in listing 3. This command will generate a .pfx file with a friendly name "myninja.ysa". We will import the certificate into IIS in later section. openssl pkcs12 -export -out mycerts\myninja.ysa.pfx -inkey mycerts\myninja.ysa.key -in mycerts\myninja.ysa.cer -name "myninja.ysa"
openssl pkcs12 -export -out mycerts\sub.myninja.ysa.pfx -inkey mycerts\myninja.ysa.key -in mycerts\sub.myninja.ysa.cer -name "sub.myninja.ysa"
Next, we will spend a minute to examine the newly created certificate. 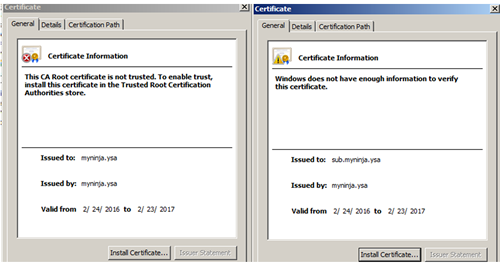 Navigate to the mycerts folder and double click to open the myninja.ysa.cer and sub.myninja.ysa.cer certificates as shown in figure 7. 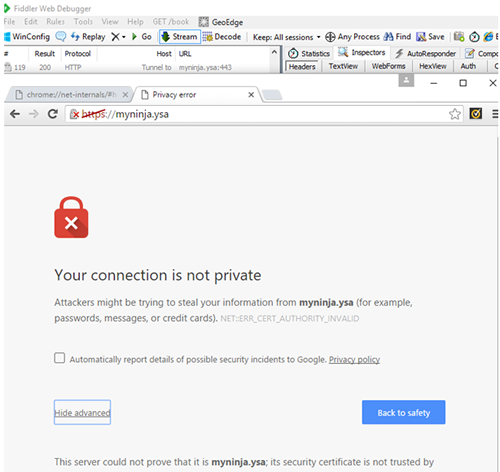 To remedy this, click on the General tab of the myninja.ysa certificate. Click on the Install Certificate button. Place the certificate in the Trusted Root Certification Authorities. At the end click Finish to complete the process. 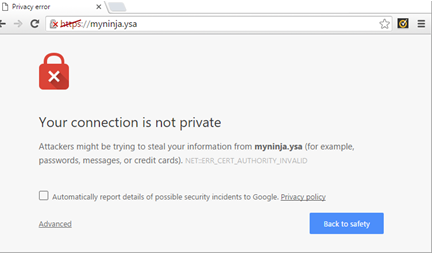 You will see a Security Warning prompt "You are about to install certificate from a certification authority (CA) claiming to represent myninja.ysa… Do you want to install this certificate", click Yes to continue. 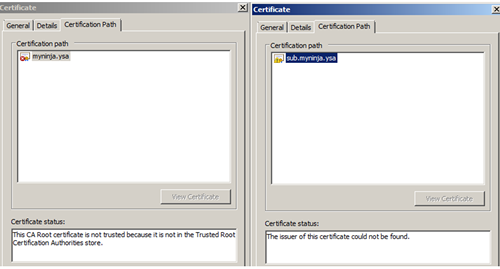 After that double click on the certificate and you should observer that the certificate status show "This certificate is OK." And the chain certificate path shows the myninja.ysa as root as shown in figure 9. 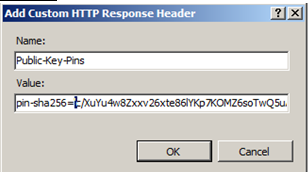 Pin-sha256 Directive - Base64 encoded Subject Public Key Information (SPKI) fingerprint. There are several ways to generate the primary key fingerprint. Let say the URL to my site is https://myninja.ysa/, and then I can run the command in listing 7 to generate the certificate fingerprint. 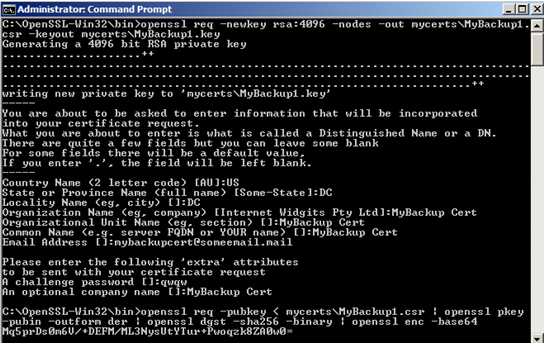 In summary, the command connects to the host, read the public key from the certificate and encode it to base64. Shown In figure 12 is the output from command in listing 7. Press Control + C to return back to the prompt. Shown in figure 13 is the result from command in listing 8. Ultimately, both methods will generate the identical fingerprint (aCJgrjda9Bvvpx791OQ8g6wksucYBFpmV3gX5sTEqyc=). I found some good reading from Scott Helme website regarding the backup pin. He pointed out that we can create some backup CSRs and includes their fingerprints in the header. To create a CSR, first run the following command. If you put everything together, the header will look something like in listing 11. The max-age was set to 10 seconds initially, you can set it to one year or 6 months once you have verify everything is working correctly. In this section, we will briefly discuss the steps to setup the HPKP on IIS. First we need to have a valid certificate or certificate that signs by a trusted CA. You will see a similar error message in figure 16 if the certificate not signed by a valid CA. That not an issue, we can manually add the certificate into the client machine trusted store. This section covers the steps to export and install the certificate on client machine. There are many ways to accomplish this task but for now, we will stick with Google Chrome. Let start by open the Google Chrome browser, navigate to the website. First thing you will see on the page is the "Your Connection is not private" warning. Click on the pad lock icon on the URL, then click on the Certification link under the Connection tab. Click on the Details tab, then click on Copy to file… button, click Next to continue. Under the Export File Format screen, select DER encoded binary X.509 (.CER), click on Next to continue. Pick a location to save the certificate file, click on Next and Finish to complete the certificate export process. Browse to the location of the certificate, double click on it, Click on Install Certificate under the General tab. Leave the default option, click on Next to continue. On the Certificate Store screen, select Place all certificate in the following store, click on Browse and select Trusted Root Certificate Authorities and OK to close the window. Then click on the Next button to continue and Finish button to complete the installation. A warning message wills popup, click on Yes button to continue. It will be much simpler to achieve the same on Internet Explorer (IE) browser. Here are the steps, right click the IE browser and then click on Run as administrator. Click on the Certificate error on the URL and then click on View certificates. Under the General tab, click on Install Certificate… button and repeat the step above to complete the certificate installation. 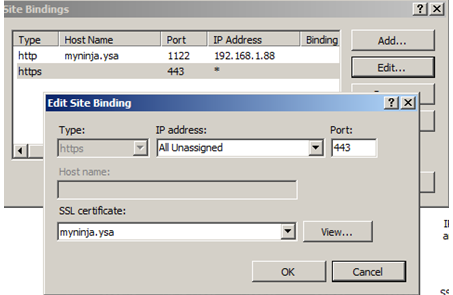 My other suggestion is, copy the certificate (myninja.ysa.cer) to the client machine and install it. Now open the Google Chrome browser and navigate to https://myninja.ysa. You should see the difference between figure 16 and 18 where the certificate error no longer an issue. On the same browser, open a new tab. Type in chrome://net-internals/#hsts on the URL, enter. 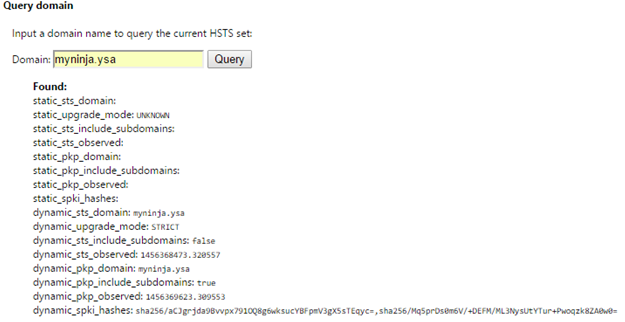 Go back to previous tab and refresh the page, then click on the second tab (chrome://net-internals/#hsts), type in myninja.ysa in the domain textbox under query domain. Click on the query button and if everything setup correctly you should see something similar to figure 19. Next, open up the web.config, modify the primary key by adding a random character at the beginning of the key. Save it, restart the IIS to be sure. 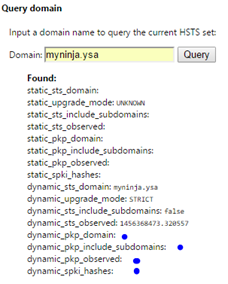 On the Chrome browser, refresh the first tab (https://myninja.ysa), on the second tab type in myninja.ysa in the domain textbox under query domain. Click on the query button and compare the result in figure 19 and 20. You will notice that the fields in blue dots were empty. In some situation, you will see the message "Not found" if the key is not valid. Go ahead and remove the random character from the key in web.config. On the Chrome browser, refresh the first tab, on the second tab type in myninja.ysa in the domain textbox under query domain. You should see the result similar to figure 19 again. If your site is public, you can scan the header through https://securityheaders.io/. Make sure to check the checkbox "Hide results" if you want to keep it private. Remember early on, one of the purposes of certificate pinning is to prevent the adversary from carry on a Man-in-the-middle-attack (MITM) attack. One thing I can think of is using Fiddler as an example. If you don't have Fiddler, download a copy, it's free from http://www.telerik.com/fiddler. Open the fiddler and the refresh the site and you will see the result in figure 21. Click on the advanced link to toggle the details. Close the Fiddler and refresh the page again. You will noticed that the page load normally without the warning message. Next, open the web.config and tamper the public key pin by adding a random character to the primary key. Clear the browser cache (Ctrl + Shift + Del) and then navigate to the website again. Open the fiddler and the refresh the site and you should see the result in figure 22. Notice the different between the message in figure 21 and figure 22. 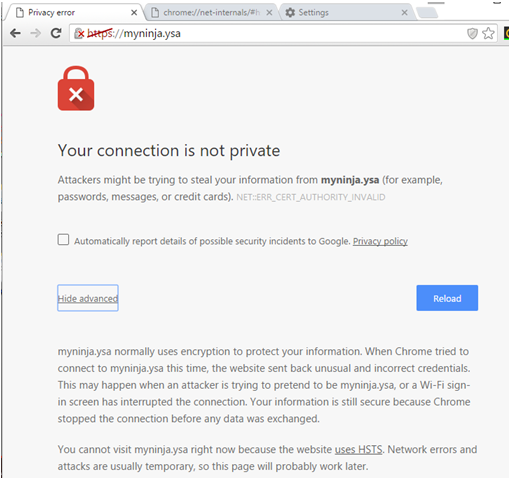 The latter has a link "Proceed to myninja.ysa (unsafe)" which will allow the user to proceed to the site. If you pay attention to figure 21, the message said "You cannot visit myninja.ysa right now because the website uses HSTS". I'm not sure why it said HSTS instead of HPKP. HTTP Strict Transport Security (HSTS) is another important security policy which enforces all the communications to send over HTTPS. You can get information on how to implement it from here. Another thing to keep in mind is that the HPKP configurations need to be updated each time we renew/replace the site SSL certificate. As mentioned in the beginning this security policy is not compatible with all the browsers yet and OWASP ranked it as low risk. Is always good to know how it works for future prosperity.